Disclosure: I was hosted at this event, but all thoughts and opinions are my own. While it’s always incredible attending a first run release opening night of a Disney movie at El Capitan Theatre (I most recently attended the opening of Mary Poppins Returns), I also love when El Capitan Theatre plays Disney classics in between the new releases! In the time between Mary Poppins Returns and Captain Marvel, El Capitan is presenting the Happily Ever After Disney Classic Series. The series features five different Disney classics, playing throughout January and February. It’s rare that you get to see older Disney films on the big screen, so it’s incredibly magical to get to see these cherished Disney films in this way, especially in the historic El Capitan Theatre filled with Hollywood magic! They always make the movie-going experience immersive, including meet-and-greets, photo ops, and sometimes even more added magic! Tonight was the beginning of the series, opening with the 1989 classic The Little Mermaid, the film that began the “Disney renaissance.” For The Little Mermaid, you can experience meet-and-greets with Ariel every night before the show, as well as a fun green screen photo op where you sit on a rock just like Ariel at the end of the “Part of Your World” reprise. This will include a meet-and-greet with Aurora before the movie. This will include a meet-and-greet with Belle before the movie. This will include a meet-and-greet with Cinderella before the movie. You can keep the Disney magic going before or after the movie! Some other Disney things around El Capitan Theatre that my family loves to do is stop by Ghiradelli (adjacent to El Capitan Theatre) for some sundaes, or special Disney-inspired sundaes that they offer occasionally. There is also the Disney Studio Store Hollywood, where you can shop Disney items exclusive to that location, as well as see what items they have on display to coincide with the movie currently running. Another thing my husband and I like to do is stroll along Hollywood Blvd to see what stars on the Hollywood Walk of Fame we can find that are related to the movie we are seeing. For The Little Mermaid, we found Alan Menken and Buddy Hackett. 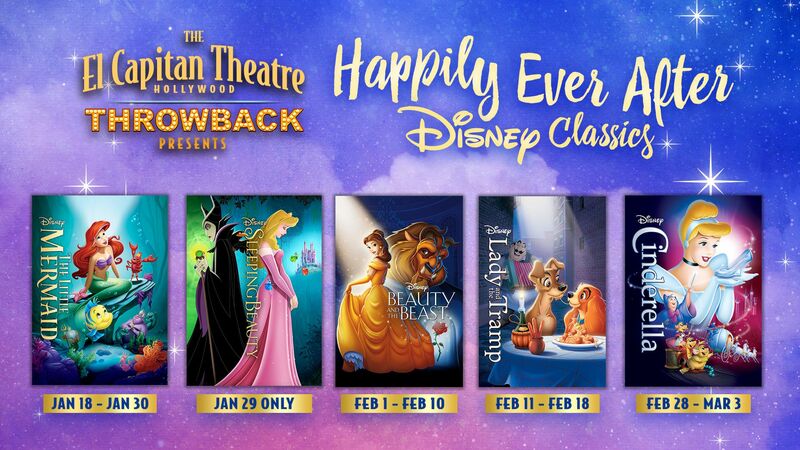 I can’t wait to see what magic is in store when we visit El Capitan Theatre for the other Happily Ever After Disney Classics series! You can find more info and tickets to the showings here.